Everything was coming together nicely for Nisa Katz, a 2010 graduate of South Lakes High School. After a long series of doctor’s visits, Katz was diagnosed in 2014 with Postural Orthostatic Tachycardia Syndrome (POTS), a condition that causes an increased heart rate when standing upright — resulting in dizziness, migraines and more. Because of it, Katz was forced to give up her photography position at Disney World and return home to Reston to her parents, Gina and Bert. Since, Katz said she has been diagnosed with a series of other conditions — Ehlers-Danlos syndrome, Chiari malformation and trigeminal neuralgia among them. Now 25, Katz finds herself traveling down a new path in life, raising awareness for rare diseases and chronic illnesses. She has started an awareness campaign called Spoonspirations — the name of which is a reference to “spoon theory,” a term coined by lupus patient advocate Christine Miserandino about how sufferers of such conditions must ration their energy. Through Spoonspirations, Katz is using her love of art to spread the word about chronic illness. Katz studied graphic design as well as photography, and she has designed a number of different pieces of apparel for various related causes. 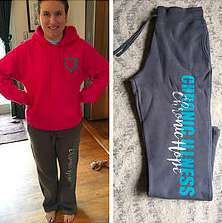 She is raising money for research in the process, as all proceeds from sales of the clothing are given to chronic illness organizations. 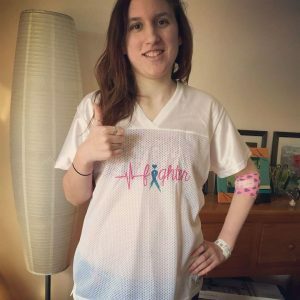 In 2016, she said, she raised $8,000 that was donated in large part to Dysautonomia International and the Dysautonomia Support Network, organizations she became acquainted with through her personal journey. This year, Katz has become involved with rare disease advocacy organization Global Genes. She will travel to Southern California at the end of the month to participate in a fashion show for the organization as part of World Rare Disease Day. Katz is hopeful that she will be able to make more connections during the event to help her expand Spoonspirations and raise more awareness for the hundreds of millions worldwide suffering from chronic illnesses.